The William Natcher Bridge east of Owensboro. Currently used by US 231. This website and this website contain more details about this bridge. 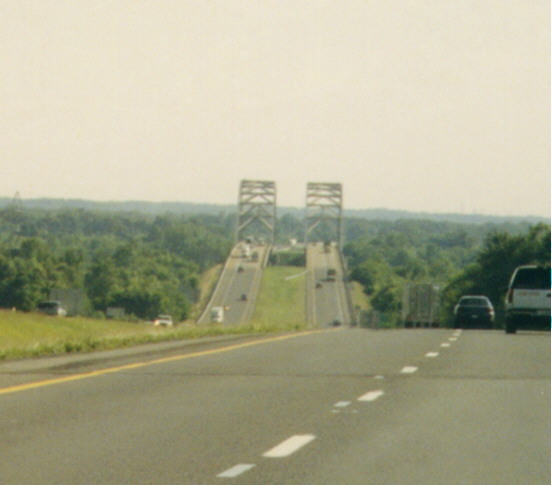 The Grover Carey bridge, until 2002, was the only way into Owensboro from Indiana. This structure even skys over US 60 along the riverfront of Owensboro. Along the Western Kentucky Parkway, you have to be alert to rocks that have already fallen instead of those that might come tumbling down (and even then, where would these rocks come from?). Photo taken in June, 1999. Paducah has gone with the designer support apperatuses for their downtown traffic lights. already broken away from the edges? You can see in the darkness on the far right an old railline and the floodwall. Photo taken in June, 1999.
the clouds. Evidently, there were no east-west roads in or out of Paducah back then (follow the rivers I suppose). Photo taken in June, 1999. The US 45 bridge over the Ohio River, between Paducah and Brookport, Illinois at dusk. Looking west (with a zoom lense) from the Paducah waterfront.